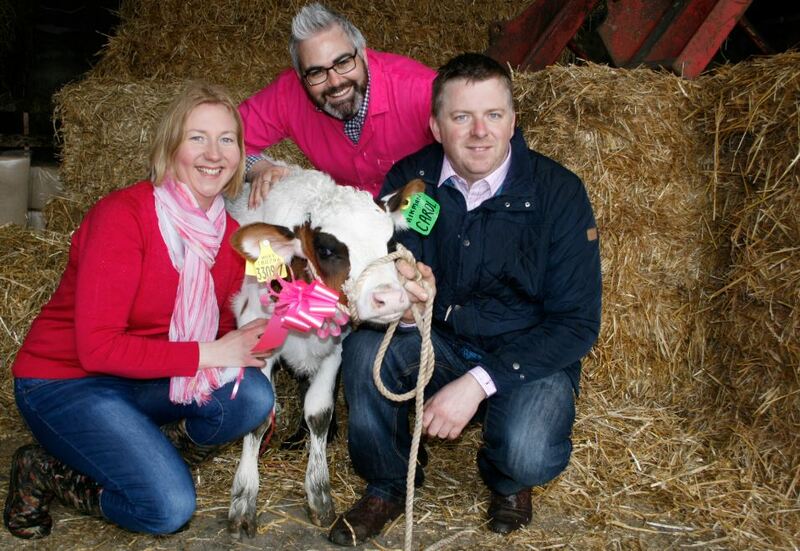 Breast cancer research at the Centre for Cancer Research and Cell Biology (CCRCB) at Queen’s will benefit by over £10,000, thanks to the inaugural Holstein Open Day held on Saturday 30 April in Armagh. Organised by Holstein Northern Ireland, the one-day event (at 35 Crosskeys Road, Armagh, BT60 3JL) was hosted by the 90-cow Moneyquin Herd owned by Ivor and Cecilia Broomfield. The highlight of the day was the auction of a two-month-old pedigree heifer calf – Moneyquin Aikman Carol Red – which sold for over £2,000 having attracted keen interest among local breeders. CCRCB, the chosen charity for this year’s Open Day, brings together scientists, doctors and nurses who, by sharing knowledge and expertise, are developing lab-based discoveries into treatments that will benefit patients in Northern Ireland and beyond. “Improving outcomes for people with cancer lies at the heart of all of our research programmes,” said Dr Kienan Savage, CCRCB, talking ahead of the event. “Researchers at the Centre have already developed tests to help those with hereditary breast cancer, pioneered a unique combination treatment for men with aggressive prostate cancer and explored new ways of treating bowel cancer that has become resistant to chemotherapy. "Among other activities on the day will be the auction of a pedigree red heifer, Moneyquin Aikman Carol red. She’s a 4th generation VG/EX from a EX90 dam. We hope she will help boost funds for CCRCB. The Open Day attracted pedigree and commercial Holstein enthusiasts from throughout Ireland. It incorporated Holstein Northern Ireland’s annual stock judging event, featured a variety of trade stands and farming equipment including a Krone 770 forager – the first of its kind in Ireland – along with educational and informative workshops. It is hoped the Open Day will be held annually on different farms across Northern Ireland and will promote best practice to identify and breed profitable cattle, educate young members of Holstein NI and provide an opportunity for farming families to socialise. Supporting local charitable causes and the development of relationships between farmers north and south are also high on the agenda. Young Holstein breeders from across the province also put their judging skills to the test, competing for a place on the Northern Ireland team at Holstein UK’s National Competitions Day which takes place at Newtonrigg College, Penrith, on Sunday 31 July. To find out more about the Centre for Cancer Research and Cell Biology (CCRCB), or to support medical research at Queen’s, visit the Development Office website or contact Helen Surgenor, (Head of Medical Fundraising), telephone 028 9097 1568.